Leiden, 1633. 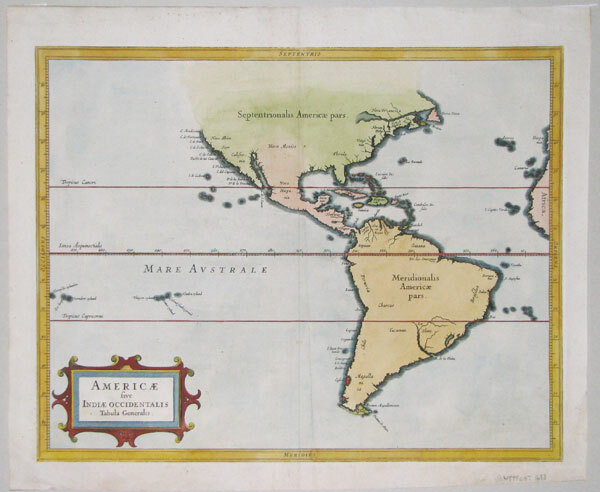 An important map of the Americas, published in the atlas of the Americas by de Laet, a director of the Dutch West India Company. As such, de Laet had access to the latest geographic data: he resisted the concept of California as an island, giving what Burden calls 'the best west coast delineation to date'. Burden also comments on the 'more open style of engraving' that influenced both Blaeu and Jansson. Frankfurt, c1638. 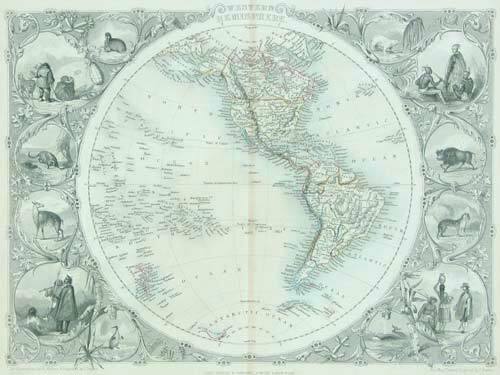 North and South America, with a decorative title cartouche and an inset of Greenland. Derived from Jodicus Hondius' 1618 map, the New England area is marked 'Norembega', and the discoveries of John Smith, including Chesapeake Bay, are ignored. Amsterdam, Jan Jansson, 1641. Despite Henricus's signature and the date of 1631, this is Jodocus Hondius Jnr's map of the Americas of 1618. It has insets of the two Poles, depicts California as a peninsula and has seas full of ships and seamonsters. Padua, Lasor à Varea, 1713. Map of America engraved by Girolamo Porro for Magini's edition of Ptolemy, 1596. Amsterdam, c.1754. Map of North and South America with fine, bright colour and with good detail throughout. Above C. Blank in California a short coastline juts westward. The Great Lakes are well-mapped. Virginia, Carolina, Louisiana are marked. South America has more detail with the interior labelled ?Land der Amazonen.? Venice, 1796. 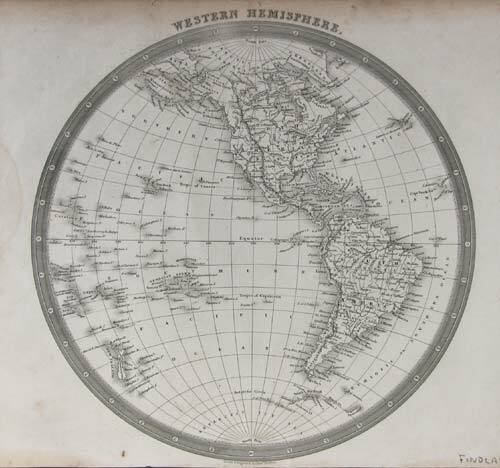 North and South America with a fictitious North West Passage marked. London, Orr & Smith, c.1840. The Americas, with New Zealand and the islands of the Pacific. London, c.1840. With Hawaii & New Zealand. London, & New York, John Tallis & Co., c.1851. 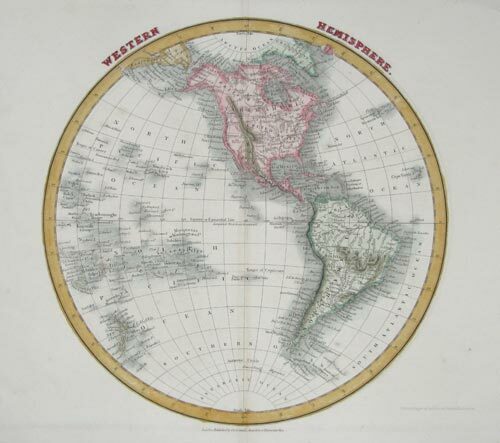 This is one of the most decorative 19th century maps of the Americas. The map is a circular hemisphere completely surrounded by steel-engraved vignettes featuring whales, natives, and indigenous animals, all tied together with a vine-style border. The map extends to include New Zealand and the Solomon Islands in the Pacific and the Cape Verde Islands in the Atlantic. Alaska is Russian America and New California occupies all the west coast. The boundaries of an Independent Texas appear but the coloring includes it as a part of the United States. The coast of Antarctica is just beginning to appear. Edinburgh & London: William Blackwood & Sons, 1856. 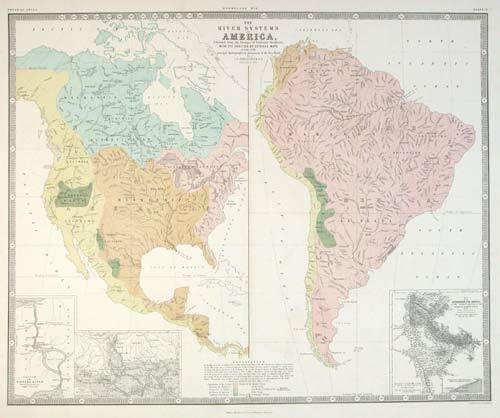 North & South America, coloured to show which ocean, etc, the rivers empty into. With insets of Niagara, the Mississippi Delta and the Orinoco.